While the S Pen is one of the main ways the Galaxy Note range stands out from rival phones, it’s arguably not the most exciting of things, but that could be changing with the Samsung Galaxy Note 9 as a reputable leaker is suggesting that the S Pen is getting a huge upgrade. What the update will entail is unclear, but AllAboutSamsung, which quickly spotted the tweet, claims to have learned that the S Pen will incorporate Bluetooth this year. It goes on to speculate that Samsung could additionally add a speaker and microphone, so you can use the stylus for calls, or let you write on a real piece of paper and have the results appear on the Galaxy Note 9, but this all appears to be pure speculation. 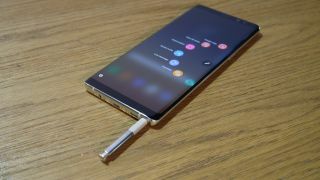 In any case, it sounds like the S Pen could be one of the highlights of the Samsung Galaxy Note 9, as rumors suggest that in many ways the phone will be a lot like the Samsung Galaxy Note 8, with a design that’s little changed and just the expected spec upgrades in most areas. We should know the truth about the S Pen – and everything else – before too long, as the Note 9 is rumored to be getting announced on August 9.